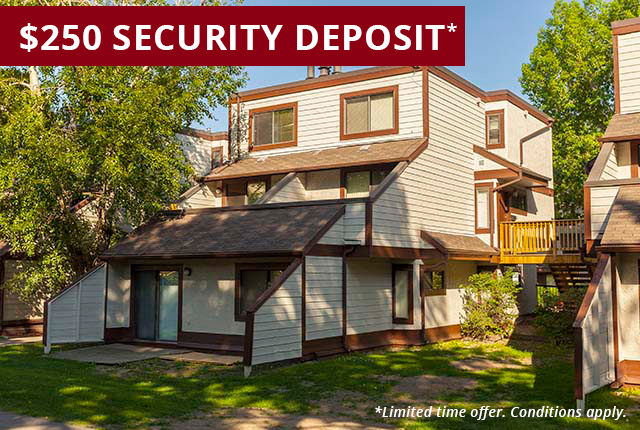 Come home to our spacious townhomes for rent in Calgary tucked into a quietenclave of the Cambrian Heights district near University of Calgary. QueensPark Village offers comfortable homes and suites in a beautiful park-likesetting. Our 2 and 3 bedroom Calgary Townhomes offer in-suite storage andlaundry hook-ups, patios or private balconies and upgraded facilities such asplug-in parking and when abundant green turns winter white, residents enjoyhearth and home with their very own fireplace. An easy stroll to shops, enjoy good access to publictransportation, a library, and nearby retail and grocery stores, schools,recreation, parks, tennis, swimming pool, golf and cycling paths. Call or visitour rental office today and tour Queens Park Village Townhomes to view thesewell-maintained Calgarytownhomes with our friendly property manager. An easy stroll to shops, enjoy good access to publictransportation, a library, and nearby retail and grocery stores. Parks in the area include Nose Hill Park, Confederation ParkCalgary and the Thorncliffe Greenview Community Association. Close to highways #1,1A,2, and 201 for easy access todowntown Calgary and the airport. Close to Many schools including: University of Calgary, CambrianHeights PS, Colenel Irvine MS, James Fowler HS and SAIT, Bow Valley College.